Today, we have reservations about spending too much time in the sun. The risk of skin cancer is high in people's minds. In the 'twenties and 'thirties it was not only the height of fashion, but it was also considered healthy. The rise of sunbathing was a complete reversal of taste from the Victorian era when it was fashionable to stay out of the sun. Victorian ladies carried parasols out of fear of the effects of the sun on their delicate complexions and leisured gentlemen avoided the sun for being mistaken for farm workers or fishermen. However, towards the end of the Victorian era, things were beginning to change. The growth in popularity of outdoor sports, such as tennis, swimming and cycling, particularly with women, meant the inevitable acquiring the semblance of a tan on those parts of the body that were exposed to the sun. Changes in working practices, resulting in the decline of agricultural work and the growth of factory work, also meant that a sun tan lost its hitherto association with manual labour. After gaining social acceptance, it was not long before the medical profession started to exploit the beneficial effects of the sun. In 1903, Auguste Rollier opened the "sunshine clinic" in the Alps for the treatment of tuberculosis. It was not until the 1920s, however, that the practice of deliberately exposing the body to the sun for the purpose of acquiring a tan became fashionable. The craze began when the artistic community first started to inhabit the Riviera in the Summers of the early 1920s. Formerly, the Riviera had been fashionable only for the Winter season. Fitzgerald, Hemmingway, Lger and Picasso all stayed at Gerald Murphy's villa at Cap d'Antibes - one of the first to have a flat roof for sunbathing. By the mid 'twenties, the seasons had reversed and Riviera Summers were in vogue. By the late 1920s, the Riviera had become simply the place to be for the young, fashionable and of course, rich. Films stars, writers, singers and artists mixed with the "bright young things" from the smart set in London under its brilliant sun. Riviera Summers were an endless experience of delightful leisure and pure enjoyment. The long Summer days gave the "bright young things" plenty of opportunity to soak up the sun's rays and turn their skins brown. Swimming and diving were the sports enthusiastically pursued. As the long days wore on into beautiful Summer evenings, the casino at Cannes, "Le Palm Beach" became a popular retreat. Cocktails were drunk throughout the night and the next day it all started again. Now a tan meant that you had the leisure and money to invest in expensive holidays at the Riviera - the social cachet of the sun bronzed skin was firmly established. 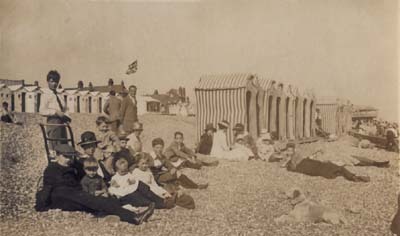 It was not long before the craze spread to England's holidaymakers and the sight of bodies grilling slowly in the British sun to varying degrees of success was common place at its seaside resorts. There are several ways of exposing the naked body to the solar rays: (a) outdoors, in a standing position, moving about; (b) outdoors in a reclining position, with the head, eyes and back of the neck shaded; (c) outdoors, as in (b), but in a "sun-box", which screens the bather on three sides from the wind, and the head in particular from the sun; (d) reclining on a bed in a ventilated glass solarium, the head, eyes and back of the neck shaded, and a cold wet cloth over the head, when indicated. The last two mentioned methods are the more scientific. In spite of these "scientific methods" and much documented evidence of the beneficial properties of sunlight, many local authorities were slow to catch onto the idea of providing facilities for sunbathing. At the time the above article was written any man bathing in the Serpentine wearing only shorts would have been fined. Only on Brighton beach were men not required to cover their upper body. The sun was used extensively to sell holiday destinations to potential visitors. Resorts vied with each other quoting sunshine statistics and even UV counts. Paradoxically ultra violet rays were thought to be health giving. The sun ray motif found its way into advertisements for the resorts, "Sun Ray" became a popular guest house name and Southern Railways coined the phrase "Sunny South" in its advertisements. In 1937, the Sun Lounge was built at Hastings, situated on the promenade facing the sea and below the town's modernistically styled Marine Court Flats. It has vast areas of glass arranged in a semi-circle giving customers plenty of opportunity to soak up the sun, even when the coastal winds are strong whilst they sip their afternoon tea or eat their ice creams. Bournemouths new Pier Approach Baths, opened in 1937, had a solarium where sunbathers could enjoy "the equivalent of natural sunlight" when the weather was less good. The use of sun lamps at home for topping up the tan was also popular. The craze for sunbathing brought a more lasting fashion in the ever changing shape of sunglasses. In the 'twenties and 'thirties, they were characteristically simple in design, usually styled in plastic, then a new material, with round lenses. The craze for sunbathing changed bathing costumes out of all recognition. It would simply not have been possible to get a tan wearing the cumbersome costumes of the Edwardian age. The classic male costume, a one piece affair in cotton with legs and sleeves, often decorated with horizontal stripes was laughed out of existence. Men's costumes now had shorter shorts and straps replaced sleeves, but the torso was still covered. In the 'twenties plain colours were generally preferred. Black, navy, maroon or royal blue were the norm. In the early 'thirties the top was often a different colour to the shorts and occasionally striped. Men in continental resorts in the 'twenties began to wear trunks and gradually the trunks became shorter, although still of the mini shorts style. By the 'thirties, trunks became acceptable in England, although some resorts still did not permit bare chests. Jantzen - the fashion leader - responded with the "topper" - trunks onto which a detachable top could be fitted. 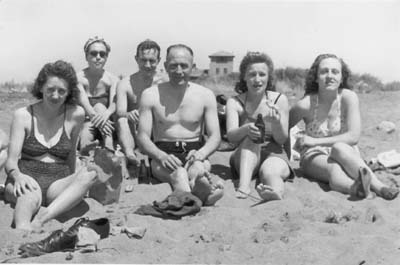 Advances in technology helped the design of more becoming beach wear when lastex, rubber combined with cotton or rayon, was introduced from America. Ladies' swimwear followed a similar evolution, although more dramatic. As the First World War approached, the frilly body covering bathing wear of the Victorian lady had already disappeared in favour of a one piece affair with almost knee length shorts. 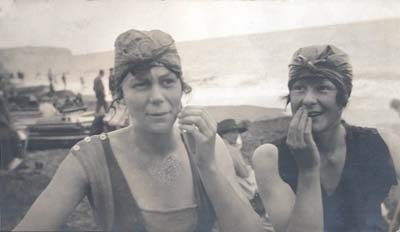 More flattering bathing wear, especially when wet, had become increasingly important as many resorts dispensed with bathing machines and segregated bathing. 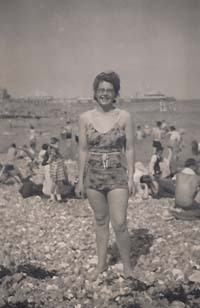 Bathing costumes were now either one piece with shorts and a sleeveless top combined or two piece with a tunic partially covering mid thigh length knickers. The costumes, like the men's, were generally made of cotton at the beginning of the decade, soon to be replaced by the more flattering machine knitted wool. Machine knitted wool may not sound very comfortable for swimming, but it was far more figure hugging than cotton. Style followed contemporary fashion with the waistline being around the hips. Costumes could be plain or patterned with stripes being the most popular, although bold Art Deco styles were not unknown. The outfits were usually finished off with a head scarf. Bathing hats made of rubber became popular in the late 'twenties replacing the head scarves. These were ideally suited to wearing over the current short hair styles, the bob, the shingle and the most extreme Eton crop. These hats usually were covered with a moulded design, sometimes abstract, sometimes floral and fastened under the chin by a rubber strap. Towards the end of the 'twenties the two piece costume had almost died out being replaced by a one piece with an overskirt. Although attractive out of water, these ladies would have looked less so when wet, as the materials used for the costumes would have still appeared bedraggled. All this changed in 1929, when Jantzen launched "the suit that changed bathing into swimming". This was a simple one piece affair, made of a figure hugging material with shorts finishing just below the top of the leg and no overskirt. In the years that followed, costumes became more revealing allowing for maximum exposure to the sun. Very soon backless costumes with large areas scooped out of the sides were worn with narrow shoulder straps or halter necks - a high panel on the front of the costume being tied around the neck leaving the back and shoulders completely exposed. By the mid 'thirties, the one piece costume had been joined by the bra and shorts style. As well as two-piece bathing costumes - shorts and bra - cork soled shoes became popular fashion accessories towards the end of the decade. Incidentally, the word "bikini", which was never used before the War, was the name of an island on which America tested an atomic bomb! Sun worship was one 'twenties fad that outlived the decade. In fact it was made all the more accessible for the majority of the public when cheap air travel opened the gateway to Spain and the opportunity of guaranteed sun. It acquired a new fashion status in the 'sixties and 'seventies, but it is finally being challenged today as we have come to realize that the sun's rays may not be as healthy and beneficial as was first imagined. This section was adapted from a chapter in "Sun, Sea and Sand"